The Presbyterian Historical Society documents the experiences of Presbyterians from across the country. As part of our series on regional history, here are five stories about the Chicago area collected by PHS. Presbyterians have been active in Chicago since the city’s beginning. The First Presbyterian Church was organized in 1833, before Chicago was officially incorporated. Early Presbyterians met in a carpenter shop inside Fort Dearborn. 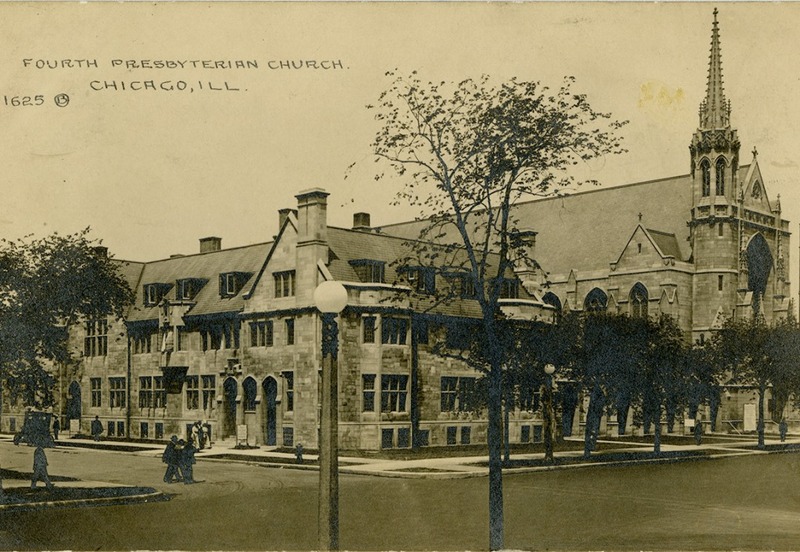 Presbyterian minister Jeremiah Porter wrote that Sabbath in the fort was “most shamefully abused” and that there were twenty stores and groceries “dealing out liquid death” (RG 425, First Presbyterian Church, Chicago, IL). Chicago’s population exploded during the nineteenth century. By 1860, the city had .1 million people; by 1890, 1 million; by 1910, 2 million. The Presbyterian population also grew. By 1900, there were over eighty Presbyterian congregations in Chicago and the surrounding area, with 20,000 church members. McCormick Theological Seminary began as Indiana Theological Seminary in Hanover, Indiana, in 1829. 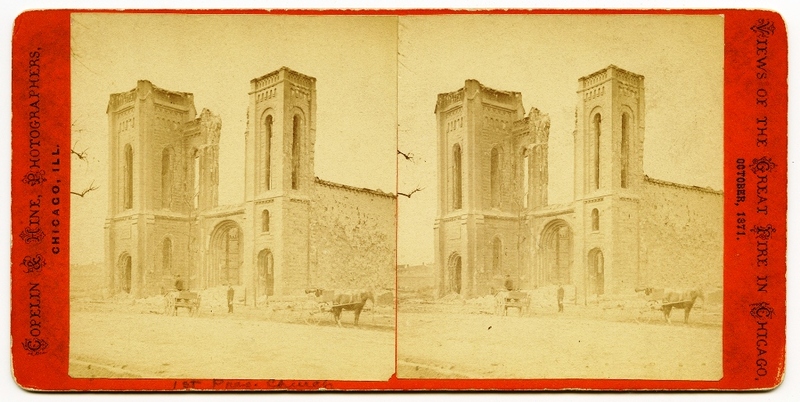 Designed to be the great seminary of the West, it struggled to survive its early years. The General Assembly voted in 1859 to move the seminary to Chicago after Cyrus Hall McCormick, owner of International Harvester, offered to pay for four professorships. Raised in the Shenandoah Valley, McCormick was a zealous Old School Presbyterian who made his fortune in mechanical reapers. The New School dominated Chicago at that time. The First Presbyterian Church was at the forefront of abolitionism in the city and sided with the New School during the 1838 split. The church put forth a resolution to the Presbytery of Ottawa in 1845 to renounce slavery and urged the Presbytery to withdraw from the denomination if the General Assembly did not make a similar stand. McCormick wanted a seminary in Chicago to break the dominance of the New School. McCormick moved to Chicago on the eve of the Civil War. In its second year, 1861, most of the seminary’s students left to join the army. The seminary would go on to survive that conflict, as well as the Great Chicago Fire of 1871; a sudden shift in the wind spared the campus. Instruction was suspended during that emergency and the school used as a temporary shelter for some of the 100,000 left homeless by the flames. Today, McCormick is one of eleven seminaries in the United States affiliated with the Presbyterian Church (U.S.A.). As the United States became an industrial power and its urban population increased, the Presbyterian Church turned its resources to providing social services to crowded city neighborhoods with large immigrant populations. Chicago’s Third Presbyterian Church started the Erie House in 1870 as Holland Presbyterian Church. 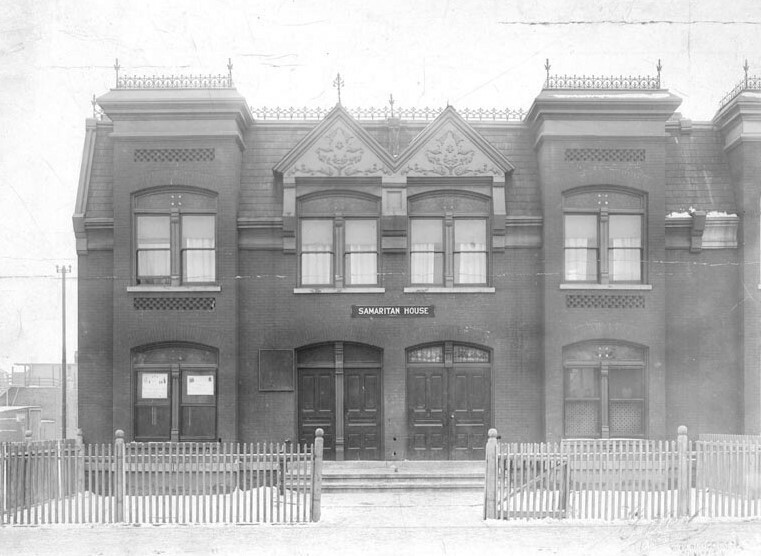 The congregation served the Dutch, German, and Scandinavian immigrants in Chicago’s West Town neighborhood, doing such a successful job of outreach that it achieved a Sunday school enrollment of 1,500 students. As the neighborhood population changed to include immigrants from Catholic countries such as Poland and Italy, the Presbytery of Chicago took over Erie House and other settlement homes like it. The homes provided after school programs and recreation, as well as additional amenities such as a reading room, day care, and English classes. Erie House was involved in one of the nation’s first Meals on Wheels programs. Other settlement homes in Chicago founded by Presbyterians include Christopher House, Samaritan House (pictured below), and Bohemian House. Many of the students from McCormick Theological Seminary used these homes to practice mission work, with as many as 114 McCormick students participating in city mission projects. Erie Neighborhood House continues today as a social service agency primarily serving low-income immigrant families. Jan Hus was a Bohemian minister who spoke out against the abuses of the Catholic Church a century before the Protestant Reformation. Born in 1369, Hus was a minister who advocated for church services in Czech rather than Latin. He rattled papal authority by claiming that the Bible, and not the pope, was the source of divine truth. Hus also protested against the sale of indulgences to finance the Crusades. He was burned at the stake in 1415. Nearly 500 years later, a large number of Czech immigrants began to settle in America. 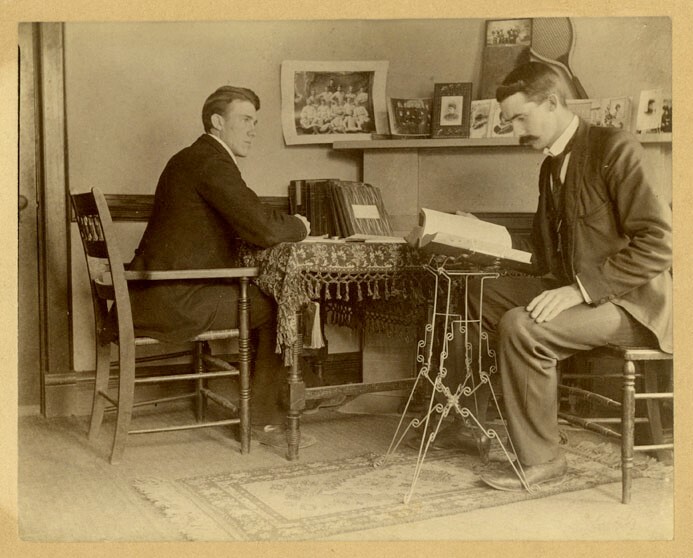 In Chicago, Fourth Presbyterian Church opened the Hubbard Memorial Bohemian Mission for Czech immigrants—an effort connected to the larger PCUSA effort to increase outreach efforts to new immigrants by establishing churches and settlement homes. In 1915, 500 years after Hus’s death, the Reverend Dr. Vincent Pisek, pastor at Jan Hus Presbyterian Church in New York City, honored Fourth Church’s efforts on behalf of the Czech community by presenting it with a Jan Hus gavel that had been assembled in Prague at the beginning of the nineteenth century from parts more than 400 years old. According to Pisek, the gavel’s wooden handle was made from a doorpost of the house where Hus was born; the gavel’s iron frame from remnants of Prague University, where Hus was a professor; and the handle from Bohemian coins, including a shilling of the Hussite king, George Podiebrad, who fought against the pope. Read the full story of the Hus gavel here. Richard Poethig is a former director of the Institute on the Church in Urban-Industrial Society (ICUIS), located at McCormick Seminary. Reverend Poethig also led the Presbyterian Institute of Industrial Relations, another church-affiliated organization active in the labor justice movement. A few years ago, Poethig sat down with PHS staff to record a Living History video featuring his reflections on labor justice and the social gospel in Chicago, other industrialized regions of the United States, and abroad. Poethig and his wife, Eunice, also served as missionaries to the Philippines. PHS is currently creating a resource guide to our collections that documents the work of the Church in Urban and Industrial Mission. We’ll have more on this project in 2016.